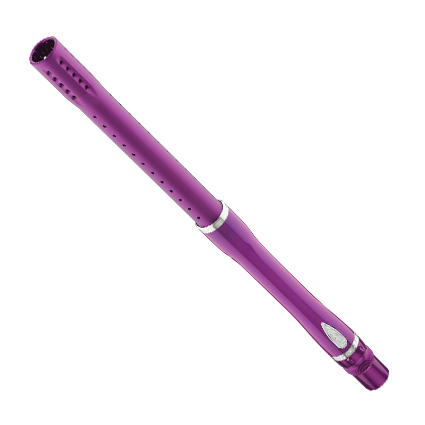 The new Dye GF Boomstick™ is the next evolution of the legendary dye barrel lines. Glass fiber “GF” barrels are constructed using the same proprietary assembly process as our tried & true carbon fiber “GF” barrels but makes use of our new glass fiber “GF” technology. This allows for amazing strength and durability, and complete customization of color. This unique fusion of materials and dye’s 20 years of barrel experience have produced yet another progression in performance of our barrel line. Just like the “CF series” barrels, the “GF series” barrels features an optimum back length of eight inches allowing the paintball to reach terminal velocity before porting begins to optimize performance. The GF/CF Boomstick™ lines are the most accurate, quiet, and efficient barrels currently available. • GF barrels are produced in cocker/matrix marker threads. • Available in 15”. Bore sizes .684 and .688. Dye’s trademark muzzle port design is another key feature that gives dye barrels unparalleled accuracy and such a low sound signature. Dye’s innovative carbon fiber structural wrap construction has set a new standard for lightweight performance in the paintball industry. Exploiting carbon fiber’s strength–to–weight ratio enables the cf boomstick™ to maintain the durability required by the sport’s most aggressive players, without sacrificing accuracy or weight. At the heart of the CF boomstick™ and GF boomstick™ is a gun drilled, surgical grade, 303 stainless steel insert. Stainless steel has an extremely low coefficient of friction and provides ultimate durability. This combination can not be matched, giving you the smoothest and straightest surface finish. 303 stainless steel is extremely high quality material that is both corrosion and scratch resistant, which yields unequaled longevity. All Boomstick™ barrels go through the same multi-phase precision honing method. This highly protected, proprietary process yields a 6-micron mirror finish that is the most accurate and consistent finish available in paintball. The multi stage precision honing removes all imperfections in the barrel’s surface. This ensures the least amount of air turbulence, which eliminates ball spin and improves accuracy.